Violence, honour, loyalty and redemption. These words can define all the works of the bestselling British author of heroic fantasy, David Gemmell. David Andrew Gemmell was born in 1948 in London, where he was brought up by his mother. Living without a father was not easy; the young Gemmell had to face the mockery of his fellow students and was soon taught by his stepfather how to stand up “without hiding behind walls or running away”. At sixteen, he was expelled from school for organizing a gambling syndicate but went on with his life and began to work. He became a journalist by chance and eventually became editor in chief. He also worked for national newspapers such as the Daily Mail, the Daily Mirror and the Daily Express. Gemmell died in 2006, while he was writing the last book of the Troy trilogy. Gemmell’s writing career really began when he was diagnosed with a cancer he believed to be terminal. In order to take his mind off his illness, he decided to write and quickly discovered that he wanted to be published before he died. His first novel The Siege of Dros Delnoch described by means of metaphors his fight against his cancer. Later, Gemmell learned that he was misdiagnosed and set aside his book until a friend of his advised him to work on it and to publish it. The book was published in 1984 under the name Legend and set Gemmell on the road of fame. Gemmell wrote over thirty novels in total, most of them were in the heroic fantasy genre, but Gemmell also wrote thrillers, graphic novels and historical fantasy novels. Unfortunately, Gemmell died before he could finish the last book of his trilogy based on the Trojan War, Troy: Fall of Kings. It was his second wife, Stella, who completed the second half of the book. 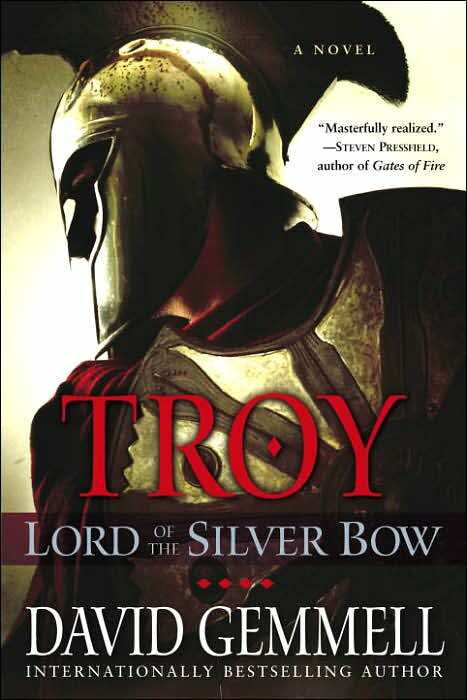 Troy: the Lord of the Silver Bow(2005) is the first volume of the Troy trilogy and can be considered as the prelude to the famous Trojan War. The hero, Helikaon, is a man of many names: For many, he is “the Golden one”, some say he is “the Lord of the Silver Bow” (Apollo) and Legends know him as Aeneas. The novel begins at the moment Helikaon sets sail for Troy and allows two Mykene ambassadors to accompany him to the legendary City of Gold, although Mykenes are Helikaon’s sworn enemies. One of them, Argurios, turns out to be the most loyal and the most honourable man Helikaon has ever met. While traveling to Troy, Helikaon picks up Gershom, the only survivor of a ship wrecked at sea, and the lady Andromache, who is to marry Hektor, the Trojan crown prince. Progressively, all characters find themselves caught in Fate’s web that leads them slowly to the greatest war they have ever seen. I have only read so far the first book of the trilogy and I am now fairly sure I will devour the two other books. What first caught my eye was not the size of the book, which is enormous, but its cover. It remains very simple but gives this feeling of power and glory that is usually associated with the Trojan War. At first, I must admit it was quite difficult to understand, for the vocabulary was technical (the first chapter takes place on a ship), but at the second attempt I was quickly able to guess the words I did not grasp at the first reading. Then, before I knew it, I finished the book within a couple of days. Not only is the story fascinating, especially for those who are very fond of mythology, but Gemmell’s style makes it also really pleasant to read. The author has the krack of turning a slaughter into the most graceful and glorious fighting scene ever. In my opinion, though the story was amazing, it was the descriptions, the dialogue as well as the right choice of words that took my breath away. Turning to the contents, I must confess I was astouned. First, I believed that the main character would be one of those great legendary heroes, like Achilles or Hektor, and it turned out that I was wrong. Aeneas, the little “forgotten one” (he is always a secondary character, even in the movie Troy; we see him only at the end), became the main character in all his glory. He is depicted as a godlike warrior, who can be gentle but also very cruel when he needs to be. He is surrounded by many other characters, each with his own personality, but only two of them have totally fascinated me. The first one is Lady Andromaque. She is a strong woman, blunt and fiery, who won’t bow to any man, not even a king. She is quite intriguing and unpredictable and plays a great part in the story. The second one is the famous king of Ithaka, Odysseus. He does not play a big role but his presence in the book lightens the mood, mainly because of his storytelling (he is known as the biggest liar and most outrageous storyteller in the world). Surprisingly enough, he is far from being handsome (his wife calls him “the Ugly One”) but otherwise he remains faithful to the myths: sneaky, wise, extremely smart and neutral. Second, the world the characters live in is incredibly realistic. No gods or magic, just pure reality. There are no elegant speeches or sparkling warriors in their shining armor; there are whores, slaves, blood and corpses. I admire Gemmell for staying loyal to the ancient myths while making them close to our reality. In sum, Troy: the Lord of the Silver is a marvelous book that combines action, humour, suspense, tenderness, love and the sunlit Aegean Sea. I heartily recommend it, this book is worth the read! “No, lass, I don’t make mistakes about people. I have two gifts that have served me well. I can spin a yarn and I can read the hearts of men and women. You are like my Penelope. You are, as you say, intelligent. You are also warm and open and honest. And you have courage and a sense of duty. My father once said that if a man was lucky he’d find a woman to ride the storm with. You are such a woman.” Odysseus, p.47. To read the first chapter, follow this link!